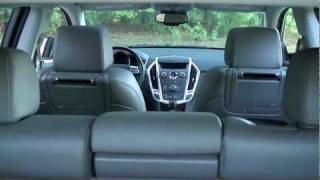 The new 2012 Cadillac SRX offers consumers the luxury they expect from a name they can trust. Improved performance comes from a more powerful 3.6L V6 pushing a respectable 308 horsepower and 265 lb.-ft. of torque. The motor includes continuously variable valve timing and direct injection to increase fuel efficiency. The new motor is considered the standard, and will be exclusive to every SRX model. The Cadillac SRX can be purchased in the luxury, performance, and Premium Collection, each with their own unique options. Returning features include a sunroof that covers 70% of the roof, and a large under seat storage area in the rear. Interior door lock switches have been added to the door panels, along with their original center console location. Cadillac brings consumers a new 20 inch wheel design and Bluetooth is now offered standard for the base model. Headlights come in the form of HID with an Adaptive Forward Lighting System for the Performance and Premium collection. New 3.6L direct-injected V-6 with continuously variable valve timing and SAE-certified 308 horsepower (230 kW) and 265 lb.-ft. of torque (359 Nm) becomes the standard engine for all models. 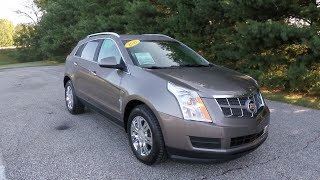 The Cadillac SRX enters 2012 with a greater combination of performance, technology and capability, building on the momentum of record-setting sales and more conquests from import owners in the mid-luxury crossover segment. Retail sales were up 17.7 percent in the first half of 2011 – a notable feat considering 2010 sales were up more than 150 percent for the year. High-intensity discharge headlamps with Adaptive Forward Lighting Systemare standard on Performance and Premium Collections. Halogen headlampswith windshield wiper-activated Twilight Sentinel feature are standard on Base and Luxury Collections. Fog lampsare standard on Performance and Premium Collections. Power liftgateis standardon Luxury, Performance and Premium Collections. Heated and power-adjustable outside mirrorsare standard on all models, with power-folding and driver-side auto dimming features standard on Luxury, Performance and Premium Collections. Rainsense automatic windshield wipersare standard on Luxury, Performance and Premium Collections. Chrome roof railsare standard on Luxury, Performance and Premium Collections. Eighteen-inch aluminum wheelsare standard on the Base model. Eighteen-inch aluminum wheels with bright machined finishare standard on the Luxury Collection. Twenty-inch aluminum wheels with bright machined finish and painted accentsare standard on Performance and Premium Collections. Twenty-inch aluminum wheels with Chrome Tech finishare available on Performance and Premium Collections. Exterior colorsinclude: Radiant Silver Metallic, Platinum Ice Tricoat, Grey Flannel Metallic, Gold Mist Metallic, Black Ice Metallic, Black Raven, Crystal Red Tintcoat, Mocha Steel Metallic and Xenon Blue Metallic (available in the fall). 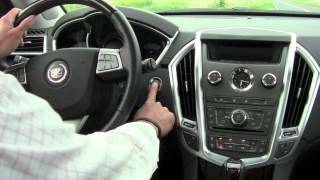 SiriusXM Satellite Radiowith three-month trial service is standard on all models. Bluetooth phone connectivityis standard on all models. Tri-zone automatic climate controlis standard on the Premium Collection and dual-zone automatic climate control is standard on Base, as well as the Luxury and Performance Collections. Driver information centeris standard on all models. Keyless accessis standard on the Luxury, Performance and Premium Collections. Ambient lighting packageis standard on the Luxury, Performance and Premium Collections. Auto-dimming inside mirror with OnStar controlsis standard on the Luxury, Performance and Premium Collections. Adjustable pedalsare standard on the Luxury, Performance and Premium Collections. 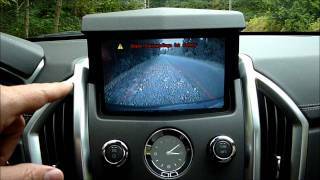 Rearview camera systemis standard on the Luxury, Performance and Premium Collections. Front bucket seats with power eight-way driver’s adjustmentare standard on all models. Heated front seatsare standard on the Luxury, Performance and Premium Collections. Heated rear outboard seatsare standard on the Premium Collection. Rear seat with 60/40-split and pass-throughis standard on all models. Leather-trimmed steering wheelis standard on all models. Heated steering wheelis standard on the Luxury, Performance and Premium Collections and includes Sapele wood on steering wheel, shift knob, center stack and doors. UltraView power sunroofis standard on the Luxury, Performance and Premium Collections. Front floor console and overhead consoleare standard on all models. Rear floor console with rear-seat audio controls and climate controlsis standard on Premium. Cargo management system and cargo shadeare standard on the Luxury, Performance and Premium Collections. Interior color and trim choicesinclude: Ebony with Ebony accents, Titanium with Ebony accents, Shale with Ebony accents and Shale with Brownstone accents. An independent McPherson strut suspension systemis standard on all models, featuring a direct-acting stabilizer bar and hydraulic ride bushings. An independent “H-arm” rear suspensionincorporates a lightweight hollow stabilizer bar. Power-assisted rack-and-pinion steeringis standard on Base and the Performance Collection. Power-assisted variable-effort and speed-sensitive rack-and-pinion steering systemis standard on the Performance and Premium Collections. Rear axle ratiois 3.39 on all models. A trailering packageis available on the Luxury, Performance and Premium Collections and increases the towing capacity to 3,500 pounds (1,587 kg).